Have we created a cult of leadership? Develop and grow or die? Update on leadership: Where does its future lie? Leading Australian management consultant, Dr Roger Collins, assists organisations and teams achieve excellence in leadership, performance, sustainable success, strategy development and implementation. 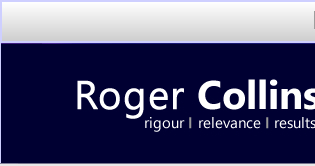 Contact Roger personally to discuss options and the range of services he can provide to improve your business. "Speaking on behalf of the HR community in New Zealand, I can acknowledge the very substantial way you have helped shaped and encouraged the HR profession in New Zealand"